OsteoHold technology with optimized cortical and cancellous zones to maximize grip in osteoporotic bone. Built-in 65° of total angulation in the favored plane in all polyaxial screws. Enhanced locking cap design for easy starting with no cross-threading. Friction-fit head to facilitate rod placement in deformity and complex spine procedures. Compact yet strong for optimum performance with different rod material choices. All implants accept multiple rod diameters using same instrumentation. Exceptional mechanical stability and intraoperative flexibility. Designed for optimal anchoring of the screw in cortical and cancellous bone of the pedicle. Allows for ease of rod placement in challenging anatomy and correction techniques in both the thoracic and lumbar spine. 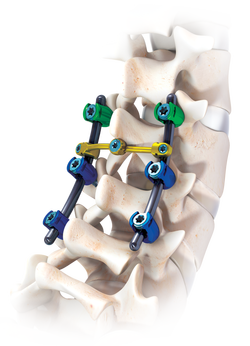 Designed to deliver torque securely under high load applications such as rod-reduction, sagittal and coronal alignment. Eliminates the need to readjust tulip heads, reduces operating time and improves rod path visualization. Ability to match the correct rod material and diameter to the specific patient’s need. Versatility and adaptation for multiple pathologies and surgical treatments. Provides a quick and rigid connection for accurate and secure maneuvering.